A wasp sting can cause minor symptoms on the skin or may cause more serious health problems such as death if the individual is allergic. In order to avoid serious complications, it is important to know the symptoms of a wasp bite, the various wasp bite treatments, and prevention procedures to follow. Before discussing wasp stings, it is useful to have some general information about wasps. There are two main categories of wasps: solitary and social. Solitary wasps do not form nests that contain many wasps. It would be unusual to get a wasp sting from this species because they rarely defend their area. They are basically out on their own. A mud dauber is an example of a solitary wasp. They build their nests out of mud and can be found on ceilings, walls, or eaves of buildings. Social wasps on the other hand, build nests that house many wasps. You will get a wasp sting or stings as a result of them trying to defend their territory and nests when disturbed. There are several varieties of social wasps. The most common are the paper wasp, the yellow jacket, and the bald-faced hornet. Paper wasps are reddish or brown in color with yellow marks and membranous wings. This type of wasp is about 20 to 25 mm long. The nest of this wasp is paper-like, open, resembles a honeycomb, and is usually constructed in above ground protected areas such as under house eavesthroughs or window ledges. Nest population is usually not more than 200 wasps. Generally, these wasps are less aggressive than the other species. They like to stay away from humans. However, sometimes there is contact between humans and paper wasps. This usually occurs at water sources or when nests are built near areas where there is a lot of human activity. In these scenarios a wasp sting is possible. The yellow jacket wasp is about 15 to 20 mm in length and has yellow or white markings on it. This wasp species likes to make nests in holes in the ground that may be excavated by the wasps themselves. The main color of the bald-faced hornet is black, but it also has yellow or white markings. It is about 20 mm in size. The nests are comprised of several tiers of hexagonal paper-like cells that are encapsulated by a papery covering. These nests are oval in shape and are usually found out in the open such as attached to branches or under a surface such as a porch. The nest can be quite large, perhaps even reaching diameters of up to 30 cm. Yellow jacket and hornet colonies can become quite large. A nest may contain over 10,000 wasps. They are attracted to certain scents, water sources, and human food. Therefore, there are many occasions for human-wasp interactions and a possible sting. Wasps tend to be more aggressive towards the end of the summer season and therefore, a wasp sting is more likely to occur at this time. Wasps have smooth, non-barbed stingers. Therefore, a wasp is able to withdraw the stinger from the skin and continue to sting. A wasp sting does not result in a stinger being left behind in the skin. Each sting injects venom into the skin that can create a variety of symptoms on the skin and in the rest of the body. Finally, when a wasp stings, a pheromone is release in the venom that signals other wasps in the colony to aid in the defense of their territory and to attack the same area that was already bitten. A sting from a wasp can produce symptoms that are local and affect only the skin or can be systemic and affect the whole body. Whether a sting will generate minor or major reactions or symptoms depends on a number of factors such as: location of the sting, the number of stings, sensitivity of the individual, age and health of individual, etc. The symptoms of a minor reaction last from a few minutes to up to an hour in some cases. These symptoms, although they are considered minor, may still last much longer. It is not too usual for these symptoms to last for a couple of days or even a week. However, if there is no steady improvement after a couple of days, then consultation with a physician is recommended. Multiple stings may cause serious problems in non-allergic individuals. Therefore, medical treatment is recommended in these situations. Stings in the mouth area may also cause breathing problems for non-allergic individuals. For some people (about 0.5 % of the population) a wasp bite may cause more severe symptoms and reactions. This usually means that the individual is allergic (systemic reaction) to the venom that was injected when the stinging or biting occurred. The result is that the reaction to the bite is no longer local, but instead affects the whole body. This is a serious situation. If a sting from a wasp initiates all or some of the above listed symptoms, then medical attention and treatment should be given immediately. Not doing so could lead to death. An allergic reaction to a wasp bite does not always occur on the first sting. Sometimes the first sting or subsequent stings initiates sensitivity of the body for the next sting. Therefore, any sting should be watched carefully even though previous stings did not cause any problems. The sting treatment that is required depends on the severity of the reaction or symptoms. For less severe local reactions, a mild pain killer such as acetaminophen or ibuprofen can be used to make the victim more confortable. Topical anesthetic creams will also help relieve the pain. Antihistamines are also very useful for a wasp sting because they help control the swelling, itch, and skin redness. Antihistamines and pain killers can be taken for several days until the symptoms decrease in intensity. Hyrocortisone creams or calamine lotion can also help reduce swelling and itch. Other treatments involve using cold compresses and ice packs (15 minutes on and 15 minutes off) to reduce swelling, ease the pain, and slow the spread of venom. A paste of baking soda can also be used to relieve some of the wasp sting symptoms. To prevent infection, it is a good idea to wash the affected area with antibacterial soap and water and treat the area with an antiseptic. An antibacterial ointment may also be used. Avoid scratching since this is a major cause for infections. For severe reactions, the main wasp bite treatment is that medical assistance is required immediately. Allergic individuals should carry epinephrine (adrenaline) injections for use should they get stung. An Epipen auto-injector is a convenient way of injecting epinephrine in the body should it be required. These individuals may also carry an extractor pump that is used to remove venom from the site of the sting. Other treatments for severe reactions may involve the insertion of a breathing tube by emergency personnel and injections of antihistamines and steroids. Note that there is no specific anti-venom to counteract wasp bites. Prevention of a wasp sting is the best treatment, especially for those individuals that react severely to them. Below are some basic common sense procedures to decrease the odds of getting a wasp sting. To prevent a sting on feet, wear shoes when outdoors and walking on grass. Avoid flower gardens, orchards, or wherever wasps are more likely to reside. Wear long pants and long sleeve shirts as much as possible when in more risky areas. Avoid dark colored clothing since it attracks wasps. Avoid products with scent, such as perfumes, suntan lotions, hair products, soaps, etc. Choose unscented products when outdoors. Some foods will attract wasps to your area. Therefore, avoid open garbage areas, keep food covered, do not leave open cans or bottles of beer or soft drinks lying around, and check before drinking from them. Keep calm when wasps come near. 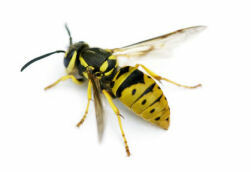 A wasp sting is more likely to occur if the wasp is agitated because of sudden movements or arms trying to swot at it. Avoid areas where nests are found. Contact a professional to remove them, if you do not feel competent enough to do it yourself. Improper removal may lead to many wasp stings.